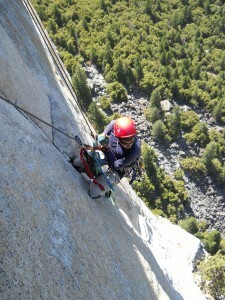 My turn to lead on Yosemite’s Washington Column arrived about halfway up the 1,100 foot rock face. The climb’s sixth pitch was a suitable choice because it’s the easiest segment of a route that stretched my modest abilities. After examining the rock features that led up towards the summit, I sorted through my rack of gear and picked out a metal stopper that I wedged into the granite crack before me. Next I attached a carabiner and atriers (ladder-like slings) so I could stand on the stopper, reach above, place more gear and climb higher. Repeating this process a few dozen times would take me to the next belay point where I would anchor myself and bring up my partner. But things didn’t work out quite that way. The instant I stepped into the atriers and placed my weight upon my first gear placement, it ripped out of the crack with a loud “pop” and sent me flying. More on that later, but first let me introduce the team. The senior partner of our expedition was Steve Schneider, a Yosemite climbing pioneer, a longtime search and rescue guru and a friend. In contrast, I’m a recreational climber of moderate skill who enjoys scaling granite when time permits. 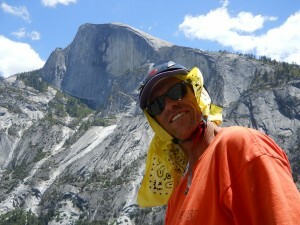 Steve has done just about every Yosemite climb there is, from the well-known “big wall” routes on El Capitan and Half Dome to dozens of others in Tuolumne Meadows that he established himself. I’ve done many of the shorter, easier classics and always wanted to get a taste of big wall climbing. So when Steve suggested we team up on the South Face of Washington Column, a intermediate route he called a “little big wall,” I was glad to rope up with him. Matt risks a look down while cleaning a pitch. We tried to avoid the brunt of the summer heat by climbing in June, but caught a triple-digit hot spell anyway that required a large and heavy water supply. So we had to make two trips each between the Ahwahnee parking lot and the base of the column, hauling gear, rope, sleeping bags, food and about five gallons of water to sustain us for three days. We started climbing at 10 a.m. as the first party of the day, moving fairly smoothly up the first three pitches despite oppressive heat that made sun-exposed granite hard to touch. One difference between our task and simpler climbs I’d done before was the necessity to haul two large bags weighing together at least 100 pounds, half of it water. But Steve handled most of that like the expert he is while I focused on keeping up and keeping hydrated. 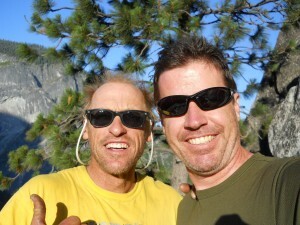 About 350 feet up, we arrived at the so-called Dinner Ledge, which oversees the east end of Yosemite Valley. We planned to overnight here on the way up and again on our way down. But with several hours left in the day, Steve thought we should get a head start on the next pitch which included the formidable Kor Roof, the crux of the climb. I belayed him as he skillfully navigated the overhanging slope and built an anchor at the next belay station. My turn. Ascending the rope with climbing tools called jumars was harder than it looked, especially where the roof juts out, but I managed with some persistence and timely coaching from Steve. Around dusk, we rappeled back to our ledge for dinner at one of the greatest camping spots anywhere. Rising at dawn the next day, we ate a quick breakfast and started our summit push. Step one was ascending our fixed rope to our highest point of the previous day. This workout got my blood pumping and I could already tell we were in for another scorching day. Step two was our first new pitch of the day that traversed to the left. Climbing horizontally instead of vertically requires a few tricky moves; Steve cruised as usual and I managed to follow him. Then Steve suggested I lead the sixth pitch, I geared up to do it and placed my first piece so poorly that it blew out the instant I stepped on it. Because I was still tied into our anchor, I fell only about three feet, though swinging 500 feet above Yosemite Valley was more than enough to make my heart pound. But there’s only one way to improve, so I pulled myself together, tried to forget the setback and started up the pitch again. The crack offered straightforward climbing but the full pitch was a long one, taking every bit of our 60-meter rope to finish. Around halfway up, I nearly ran out of gear and Steve sent up another supply of stoppers and camming devices on our second rope. Even so, I had to recycle gear near the end just to reach the anchor. Aid climbing, which involves using gear to hold one’s weight, takes longer than free climbing, using gear just to protect against falls. This is especially true for novices, and my single lead pitch took two and a half hours. My throat was painfully dry at the end, and while Steve followed, I hurried to pull up our haul bag full of much-needed water. The last four pitches that followed were less dramatic yet still rewarding. From the summit, we got a terrific view of Half Dome, which looked close enough to touch. A few hours of rappeling took us back to Dinner Ledge. On the way, the heat kept beating down on us until we finally drank the last of our water. 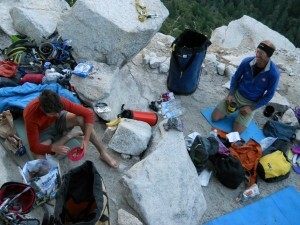 But thankfully, we discovered there a gallon jug left behind by other climbers, enough to last us another night. So we spent a second evening under the stars, enjoying the view, a hot dinner and a few beers Steve thoughtfully packed along. I felt pretty good about the climb and the pitch I had led on it. Then Steve called his wife to check in; even big wall climbers are electronically tethered to the world these days. We found out that our friend Hans Florine and his partner Alex Honnold had broken the speed record on The Nose on that same day. 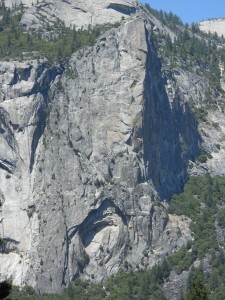 Most climbers take about five days to climb the 2,900-foot route on El Capitan. Hans and Alex did it in an unthinkable two hours and 23 minutes. In other words, they had climbed 31 pitches faster than it took me to lead one! We got a laugh from that and called Hans to congratulate him. The absurd contrast reminded me that there will always be mountain-sized room for improvement those who would test themselves in outdoor places like Yosemite.